Come and join me as I return to the beautiful Tofte Manor, for a full days retreat to celebrate the winter solstice and to take some precious self care time for you ahead of the busy festive period. The highlight of a days retreat at Tofte, is walking the labyrinth. 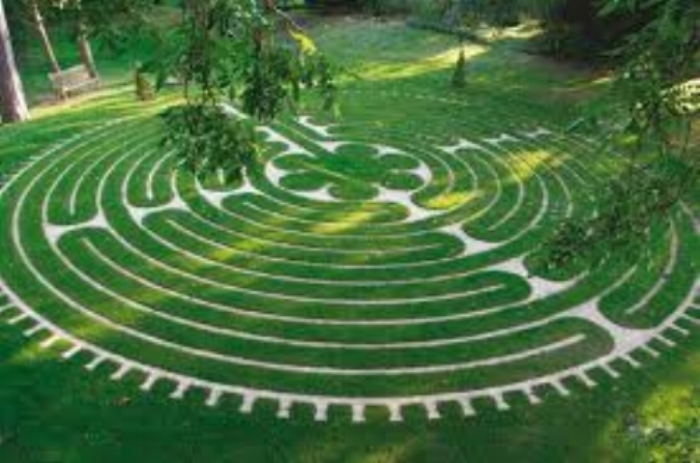 It is said that we lose ourselves in a maze but we find ourselves in a labyrinth. I have brought groups here before and this is a really powerful one. There is a large crystal at the centre and you can really feel its energy. We will practice in the beautiful crystal room, which has underfloor heating and giant quartz crystals in the corner. The day includes a healthy and delicious vegetarian / vegan lunch. As we gather together, we will reflect on the period that has passed and set clear intentions for the period ahead; as usual for my retreats, I will weave in the myths of the goddesses with energising and uplifting flows, with deeply held restorative poses, balance, time in nature, journalling time, ritual and we will of course finish with a beautiful yoga nidra! Your investment for this full day of deliciousness, connection and divine self care is just £97 and spaces are limited to just 14 people. I look forward to sharing this magical time with you.